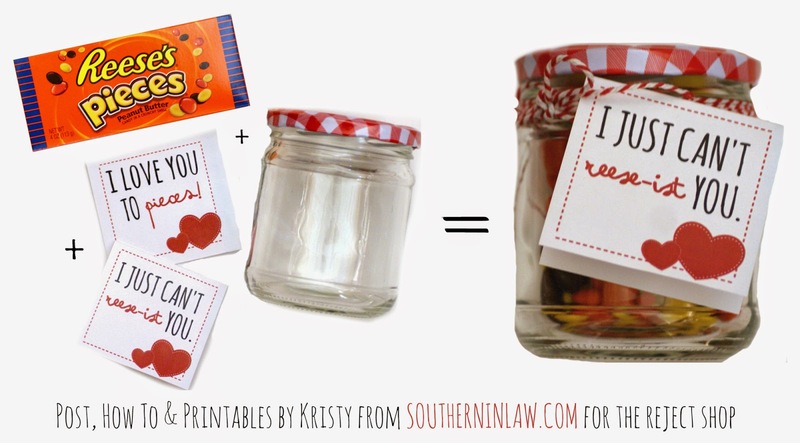 Southern In Law: My Punny Valentine: 40+ Punny Valentines Gift Ideas with FREE Printable Gift Tags! 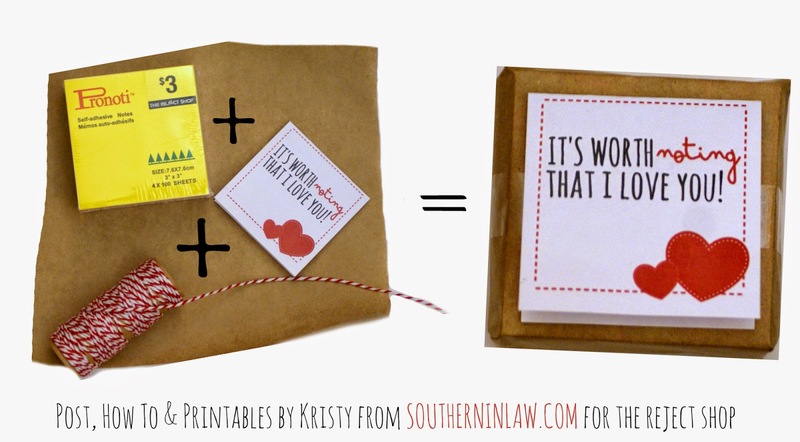 My Punny Valentine: 40+ Punny Valentines Gift Ideas with FREE Printable Gift Tags! If you've been reading Southern In-Law for a while, you would have realised that I'm a bit* of a dork - and obviously that means I LOVE puns too! 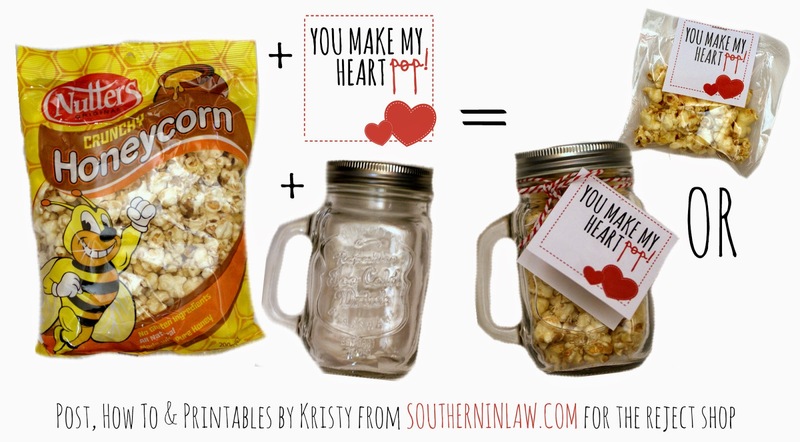 The Ultimate Punny Valentines Gift Ideas list. And that's exactly what I've put together. 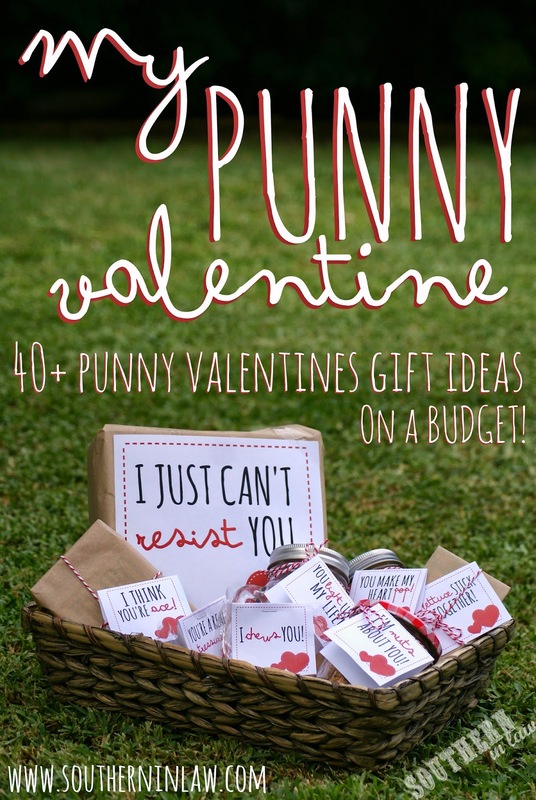 40+ Punny Valentines Gift Ideas on a budget, free Valentines Printable Gift Tags and there's plenty of gift ideas for everyone in your life - from candy focused gifts to non-food valentines gift and small gift ideas for friends and everyone in-between. So let's get onto the fun, shall we?! download the Printable Gift Tag! Or view them all here! Let's Go Shopping! All of these items can be found at The Reject Shop and the finished gift will likely cost you less than $10! I chews you! This gift idea can be adapted to suit your loved one's favourite chewy lollies (or chewing gum!). 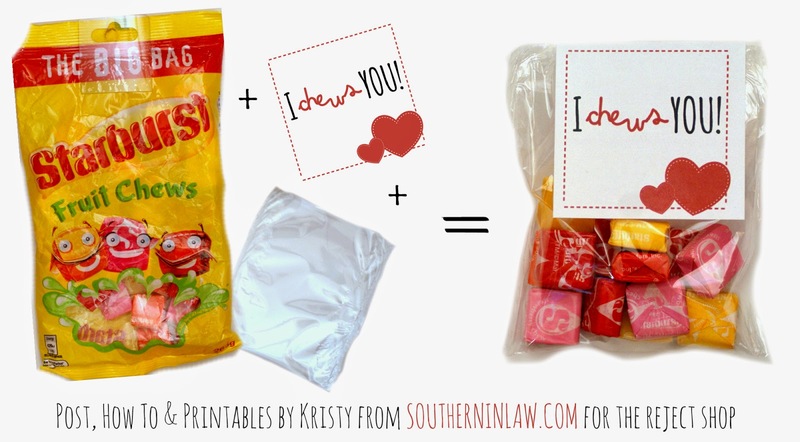 Simply pop some Starburst Chews ($3.50 for a big bag) or lollies of your choice into a DIY cellophane bag (instructions below) and attach your label. Alternatively, pop the chews into a jar, box or gift bag of your choice! Let's Go Shopping! All of these items can be found at The Reject Shop and the finished gift will cost you less than $5! You make my heart pop! Grab a bag of Honeycorn ($2 a bag for serious deliciousness) and fill up a drinking jar ($2) or jar of your choice ($2-5 at The Reject Shop) and attach your gift tag with a ribbon. You can also place the popcorn into a cellophane bag, however, I highly recommend using a sealed container so your popcorn stays fresh! You're a real treasure! 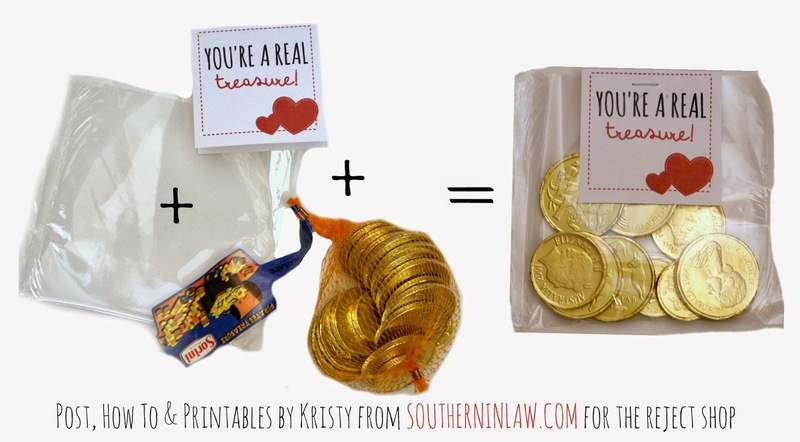 Pick up some chocolate coins from your local Reject Shop ($2 a bag) at pop them into a cellophane gift bag (how-to below) and attach your label. Kisses from me to you! Grab a bag of Hershey's Kisses ($7 for a 311g bag - we highly recommend the caramel kisses!) and pop some into your cellophane bag or a treat box/jar of your choice and then attach your label! 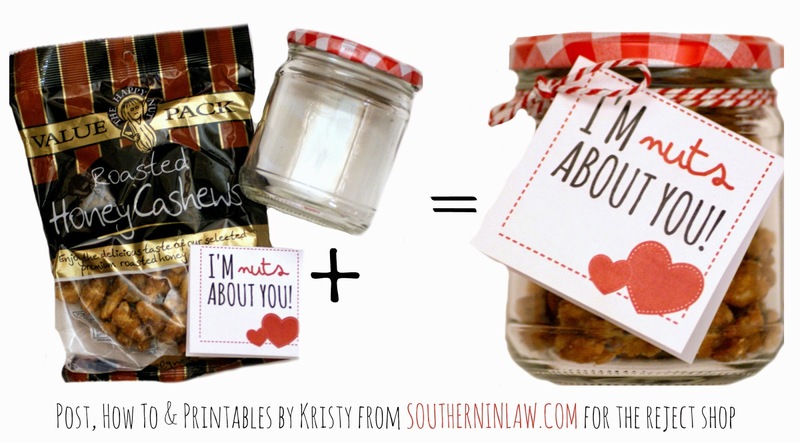 Why not try a jar full of kisses instead of a bag?! Let's Go Shopping! All of these items can be found at The Reject Shop and the finished gift will cost you less than $7! We're mint to be together!/We're mint to be friends! 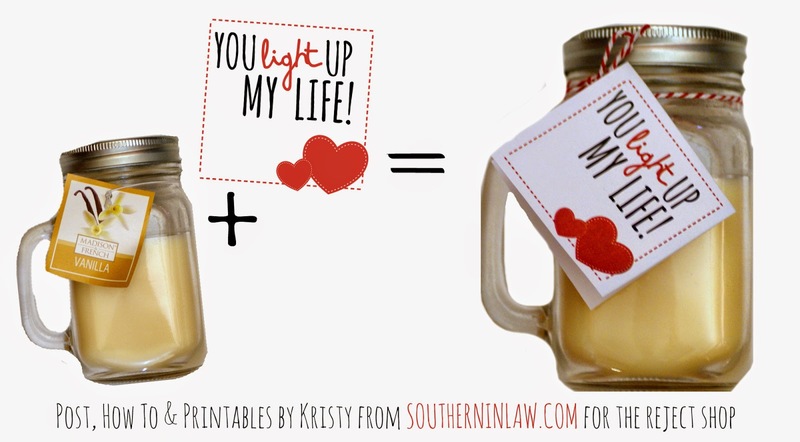 This gift idea has both a friend option and an option for your honey. 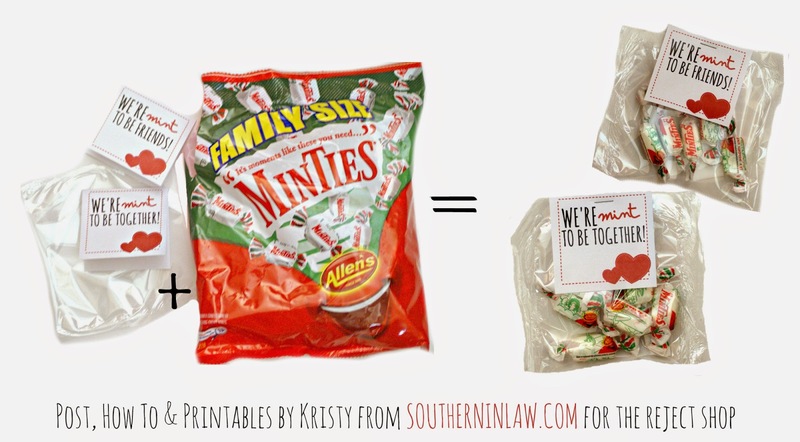 Simply grab a family sized bag of minties ($4.50) and fill up your cellophane bags (how-to below) or jar/box of your choice and then attach your labels! Let's Go Shopping! All of these items can be found at The Reject Shop and the finished gift will cost you less than $10! I'd go the extra mile for you! 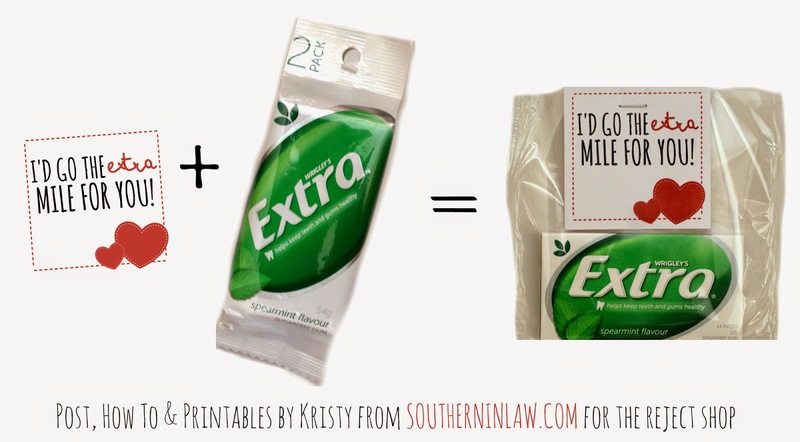 Wrap up a packet of extra gum ($3 for a 2 pack) and attach your label for this simple gift idea! I'm nuts about you! Grab a bag of Honey Roasted Cashews ($4 at The Reject Shop), pop them into a jar of your choice ($2-5) and attach your label with some baker's twine ($4 a roll). Lettuce stick together!/I think you're a sweet pea!/I've got all the thyme in the world for you! 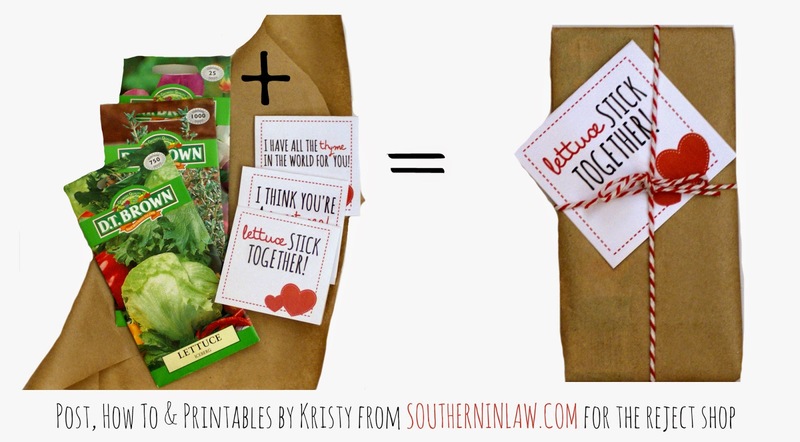 Valentines Day doesn't have to be candy focused - this gift idea is perfect for anyone who loves gardening. Wrap up a packet of seeds ($1.50 at The Reject Shop) in some brown craft paper ($2 a roll) and attach your label with some baker's twine ($4 a roll). I think you're ace! 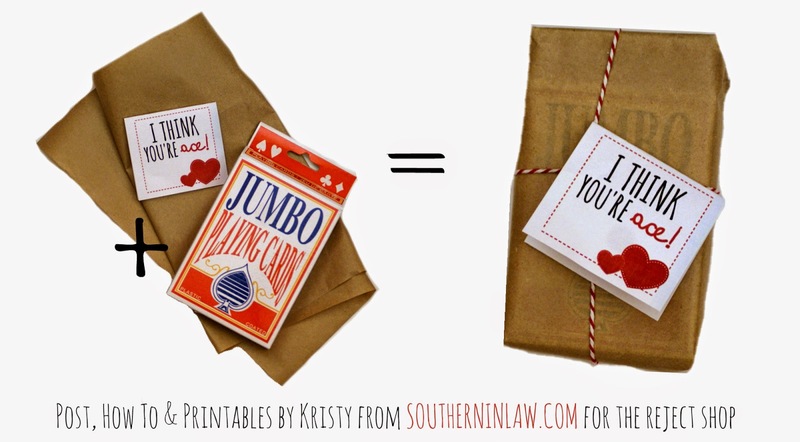 Wrap up a box of playing cards (Jumbo playing cards $2) in some brown craft paper ($2 a roll) and attach your gift tag. You light up my life! Choose a candle from The Reject Shop's awesome range (from $1-10) and simply attach your label. The vanilla Mason Jar candle we used was $7 and smells amazing. I'm hooked on you! 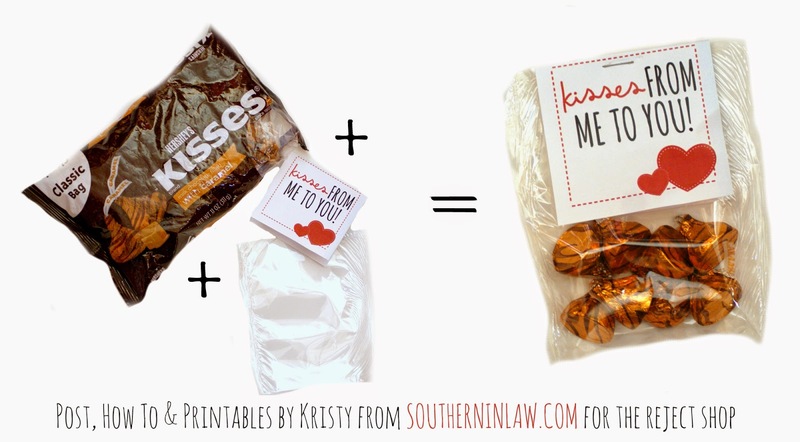 Just add some sour worms (or any worm shaped/fish shaped candy you like) and pop them into a cellophane gift bag (how-to below) or jar of your choice and then attach your gift tag! Let's Go Shopping! You'll find gummy worms in the candy section of The Reject Shop! I love you a latte! Wrap up some latte mix (or pop some in a mug and then wrap it all up in cellophane) and attach your gift tag with some baker's twine! Let's Go Shopping! You'll find Nescafe Latte sachets at The Reject Shop as well as cute mugs and coffee cannisters that are perfect for this gift idea! I love you berry much! Pop some berry flavoured or strawberries and cream lollies into a cellophane treat bag (how-to below) or jar of your choice and attach your gift tag! Let's Go Shopping! You'll find Strawberries and Cream lollies and Raspberry lollies at The Reject Shop in the candy section! Life without you is un-bear-able! Pop some gummy bears into a jar or treat bag (how-to below) or wrap up a teddy bear and attach your gift tag! Let's Go Shopping! You'll find gummy bears in the lolly section of The Reject Shop as well as plenty of cute teddies in the toy section! You make my heart glow! Wrap up some glow sticks and attach your gift tag! Let's Go Shopping! You'll find glow sticks in the party section of The Reject Shop! I'm not playing Twix, I love you! Wrap up a twix bar and attach your gift tag with some baker's twine! Let's Go Shopping! You'll find Twix bars in the candy section or by the registers at The Reject Shop! Let's Go Shopping! You'll find plenty of socks to choose from at The Reject Shop! Without you I'm toast! Wrap up a toast stamp or your loved one's favourite toast toppings and attach your gift tag! You colour my world! Wrap up some coloured pencils (crayons/textas etc) or pop some skittles into a jar or cellophane treat bag (how-to below!) and attach your gift tag! Let's Go Shopping! You'll find plenty of bright coloured gift ideas at The Reject Shop! You make my heart beet! Wrap up some beet seeds for your favourite gardener and attach your gift tag! Let's Go Shopping! You'll find beetroot seeds (as well as plenty of fruit, veggie and flower seeds) at The Reject Shop in the gardening section! You make my heart bounce! Pop some bouncy balls into a jar or cellophane treat bag and attach your gift tag. Let's Go Shopping! You'll find bouncy balls in the toy section of The Reject Shop! You really measure up! Perfect for the baker in your life, wrap up some measuring cups/spoons or a measuring jug and attach your gift tag! Let's Go Shopping! You'll find measuring cups, spoons and jugs at The Reject Shop for less than $10 in the kitchen section! You're a cut above the rest! Another gift idea perfect for bakers! 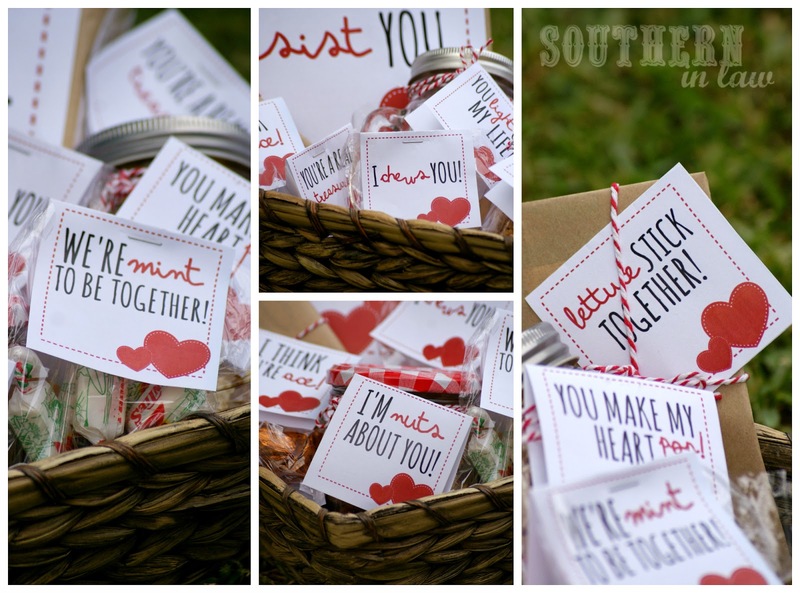 Wrap up some cookie cutters or simply attach your gift tag with some bakers twine to a heart shaped cookie cutter! Let's Go Shopping! You'll find cookie cutters in the kitchen section of The Reject Shop! You're a lifesaver! Attach your gift tag to a pack of lifesavers and gift them to a great friend or loved one! You're my cup of tea! Attach your label to your loved one's favourite tea or a cute mug or tea cannister! Let's Go Shopping! You'll find tea bags in the food section of The Reject Shop as well as tea cups and cannisters in the kitchen section! You're the highlight of my day! Wrap up some highlighters and attach your label with some bakers twine! Let's Go Shopping! You'll find plenty of highlighters in The Reject Shop in the stationery/art supply section! But tell me, are you a Valentines fan? What's the best Valentines gift you've ever given or received? Food puns are THE BEST! I'm such a nerd about them! My fiance makes fun of me because it doesn't matter how lame the food pun may be, I always crack up over it and think it's the best thing in the world. I'm using that "I just can't reese-ist you" pun for him this year for sure! One of his favorite candies is Reese's. Perfect! Thank you so much! Yay! I am so glad you loved them, Jessica! i am seriously going to do everyone of these up in a big hamper my partner LOVES puns so this will be awesome !!! !